Friedrich Schiller wrote of the Thirty Years War that history had brought forth a great moment, but the moment encountered a mediocre people. The world today finds itself by contrast in a mediocre moment, but it still may find adept leadership. No-one would have expected that Germany would decide the fate of the world financial system. International financial institutions – the International Monetary Fund, the Bank for International Settlements, and the European Central Banks – used to formulate the consensus of major governments and elite opinion. For understandable reasons, Germany was content to take guidance from the international financial community and act as a member of Europe rather than as a national power. Now the international consensus has collapsed, elite opinion is confused and Germany has become the arbiter of the European financial crisis. The US administration’s economic policy has produced poor results and the American president wants to blame his problems on you. Your neighbours, the IMF, and the Obama administration are trying to persuade you to extend Germany’s credit to paper over the indebtedness of the rest of Europe. Yet common sense makes clear that Germany’s resources are finite, while German voters fail to understand why they should put their future in jeopardy to support countries plagued by corruption and inefficiency. It is impossible to prevent the destruction of large amounts of nominal wealth, but it is indispensable to preserve the functioning of the banking system. 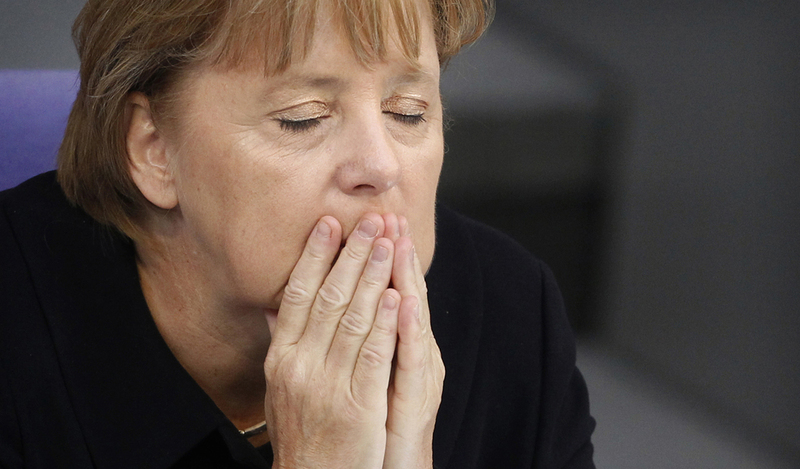 Germany cannot bail out everyone, but it must create a firewall in the right location. This is a practical rather than an ideological matter. There are two questions: where should Germany provide support, and how? It is not enough to refuse the unreasonable demands of your partners, for example, to issue so-called eurobonds (guaranteed de facto by Germany but spent by Europe’s laggards). You also must make clear to the markets what the worst-case scenario might be. At present, Germany appears to respond to events rather than anticipate them. That increases uncertainty and the risk of a major financial crisis. If Germany acted with clarity, though, the outcome would not be a crisis, but rather the deliberate amputation of gangrenous parts of the financial system in order to salvage the whole. Ultimately, you will have to sacrifice Spain. That will compromise the French banks, which in turn will require German support. Spain is unsalvageable. It is better to take the pain early and deliberately, rather than later and chaotically. Dealing expeditiously with Spain, moreover, should convince Italy to adopt the reforms which can prevent it from following Spain and Greece into de facto national bankruptcy. Spain’s construction sector dominates the national economy. Delinquent loans to the construction sector reportedly total about 20% of GDP, and probably exceed twice that amount. The debt of Spanish financial institutions stands at 109% of GDP, double the ratio in France or Germany, and triple the ratio in the United States. The debt of Spanish financial institutions since 2003 grew at twice the rate of the US or the UK, and four times the rate of Germany. The trouble with Spain is that its construction sector is enormous relative to the overall economy, as large as the manufacturing sector. By contrast, America’s construction sector at the height of the real estate bubble was only a third the size of its manufacturing sector. In Germany, construction is just a fifth the size of manufacturing. This distortion in Spain’s real economy – the massive misallocation of resources to the construction sector-is reflected in an enormous expansion of the banking sector. Spanish banks’ debt on the international bond market grew twice as fast as in the United States during the past decade, and several times as fast as in Germany. What is this the debt of Spanish financial institutions, estimated at 109% of GDP, actually worth? According to Spain’s own data, delinquent loans amount to nearly a fifth of GDP, or 184 billion euros (US$228 billion). That would wipe out all the remaining shareholder value attached to the Spanish banking system. It seems obvious from the data, however, that Spanish banks’ bad loans are far in excess of the reported 184 billion euros. Alone in the world, Spanish banks drastically increased their lending after the 2008 crisis – by nearly two and a half times – while overall bank lending in the United States and the eurozone barely changed due to weak economic conditions. It is widely reported that Spanish banks are piling new loans of bad old loans in order to avoid reporting losses that now probably exceed two-fifths of GDP. In America, the tumour was operable – just barely. In Spain, where the tumour is three times the size in relative economic terms, it is inoperable. That is why Spain continues to increase leverage rather than reduce it. The patient (namely the Spanish banking system) must die with the tumour, and with it a very large part of Spanish private wealth, including Spanish bank debt held by Spanish households, pension funds, and insurance companies. Pensions and insurance payments will be reduced and the Spanish will be poorer. Nonetheless, the deposits and other short-term obligations of the Spanish financial sector (and all European banks) must be guaranteed. Once its equity and $1.6 trillion in debt is reduced to zero, the Spanish financial sector will become a desirable investment for an outside investor with ready cash – the Chinese, or Canadians, or sovereign wealth funds. Maintaining the day-to-day functioning of the financial sector must be preserved in anticipation of the intervention of an outside buyer; it is an investment that will be repaid. The Spanish won’t like having foreigners take over their finances, but they will have only themselves to blame. All of this will make clear to the Italians why reform is a much better idea than bankruptcy. Italy’s condition is much better than Spain’s. It never had much of a real estate bubble; it has relatively little private debt; it has hundreds of first-rate companies with secure niches in world export markets; and it has valuable national assets whose sale could reduce its sovereign debt considerably. What Italy lacks is political clarity. The appropriate handling of Spain will provide the required object lesson. You should ignore pressure from the Spanish government and the international institutions to support the debt of Spanish banks. It is worthless, and there is no point impairing Germany’s credit to support a $1.6 trillion pile of worthless paper. The international institutions will tell you that a Spanish bankruptcy will compromise the French and British banking systems, because French banks are massively invested in the public and private debt of other European nations. The old capital coverage rules for commercial banks made it prohibitively expensive to own subordinated debt, but very cheap to own senior debt. You should ignore these warnings. If necessary, bail out the French banks after Spain’s bank debt has been written down to an appropriate valuation, which probably will be close to zero. The subordinated debt of French banks may not survive. But that is owned by households directly or through pension funds and insurance companies, and is mostly in French hands. If the French banks’ subordinated debt is valued at zero, the French people will be poorer, but there will be no systemic consequences. French savers will be angry, but that is a matter between them and President Francois Hollande. The senior debt of the French banks, though, is viable – because the French economy is viable – and supporting the French banks’ senior obligations is required to prevent a financial crisis and economic collapse. It would be something of a revolution in world affairs for Germany to ignore the international consensus and undertake to resolve the crisis on its own initiative. I submit to you, Federal Chancellor, that it is time for such a revolution. Credit: This edited article is used courtesy of Asia Times Online, who retain copyright.